Does not include the mobile versions' microtransactions. Enable Vsync in-game to avoid various issues including mouse sensitivity problems. 8.1 Loading stops at "Downloading assets... 0%"
PlayerPrefs.txt contains all settings as well as turntable model unlocking progress. *.xml files are generated during gameplay and don't contain useful settings. dxmsave.sav contains current save data. endgamesave.sav contains endgame save data (only exists after completing the game). 60° vertical. Can be modified with FOV Changer. 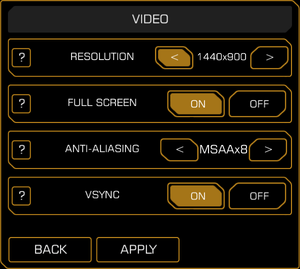 Set in Options, Video or toggle with Alt+↵ Enter. MSAA up to x8; for SGSSAA see Anti-aliasing (AA). Disabled by default. Set in Options, Video. Enable to fix various issues. No frame rate cap. Framerate affects zoom out recoil effect. SGSSAA can be forced with Nvidia Inspector (Nvidia cards only). Download and run NVIDIA Profile Inspector. 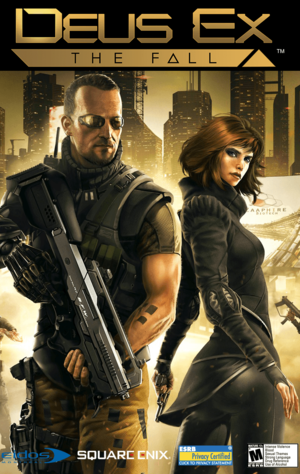 Copy the compatibility bits for Deus Ex Human Revolution to a new profile for Deus Ex: The Fall. Set the anti-aliasing quality and sampling for the profile. Added in 1.0.1 patch. Quick save/load can only be remapped by editing a config file. Moving a cursor for a pixel (or more) while clicking on the button, will make the game ignore the input. Touchscreen functionality has been removed. 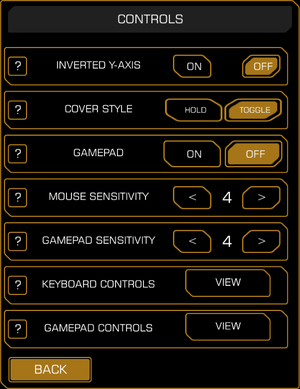 Third-party XInput controllers are not recognised. Music, Sound FX and Dialog. Enabled by default. 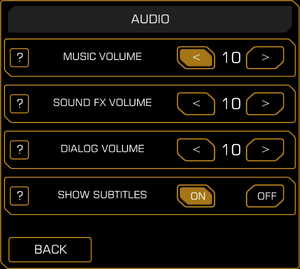 Toggle in Options, Audio. Instead of mute music uses low-pass filter. The 1.0.1 patch did not add surround sound support, it simply corrected an incompatibility with surround sound systems. Use Helix Mod: Deus Ex the Fall. Third-party XInput controllers do not work with this game; only official Microsoft controllers are detected correctly. There is no known solution. Loading stops at "Downloading assets... 0%"
Restart Steam in offline mode. Delete or rename the Deus Ex_ The Fall folder. The game should now launch properly. Create an outbound traffic rule that blocks the game's .exe file within the steamapps folder. Open SweetFX_Settings.txt, find define USE_SMAA_ANTIALIASING 1. Change 1 to 0. Find define USE_LUMASHARPEN 1. Change 1 to 0. ↑ 2.0 2.1 File/folder structure within this directory reflects the path(s) listed for Windows and/or Steam game data (use Wine regedit to access Windows registry paths). Games with Steam Cloud support may store data in ~/.steam/steam/userdata/<user-id>/258180/ in addition to or instead of this directory. The app ID (258180) may differ in some cases. Treat backslashes as forward slashes. See the glossary page for details. This page was last edited on 29 January 2019, at 23:31.